Like many aspiring authors, I have always dreamed of writing a novel. When I retired and began learning what I could do on my first computer, I began writing a story about the adventures of a fictitious pastor. Family and friends suggested ideas which led to many re-writes. My only goal was to develop believable characters and a story which was exciting to read. Paul Walker entered a Lutheran seminary in the Midwest, young and idealistic, never suspecting his life as a parish pastor would introduce him to two kinds of terror. When the young janitor at Trinity Lutheran is found dead in the church, Pastor Walker’s life is thrown into turmoil as police search for the killer. Grieving church members threaten Paul’s ministry and marriage. Years later, after sponsoring a refugee from Iran whom they believe to be a Christian, the congregation is held hostage by terrorists who threaten to blow up the church and everyone inside. Again Paul wonders how he and the church can survive the terror at Trinity. 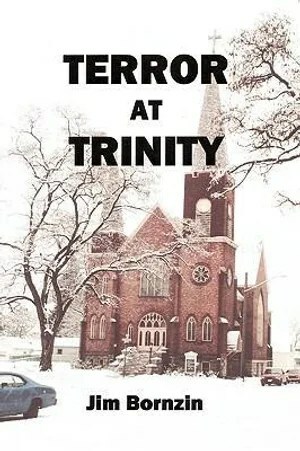 “Terror at Trinity” is the compelling story of a pastor and his wife who share the tragedies and triumphs of parish ministry. It is contemporary, fast-paced, and spiced with humor. Set in the context of faith and the church, this provocative story is intended to entertain, inform, and inspire.